The Hampton Bay 70 CFM Exhaust Fan will reduce moisture and humidity in your bathroom to help prevent mildew. 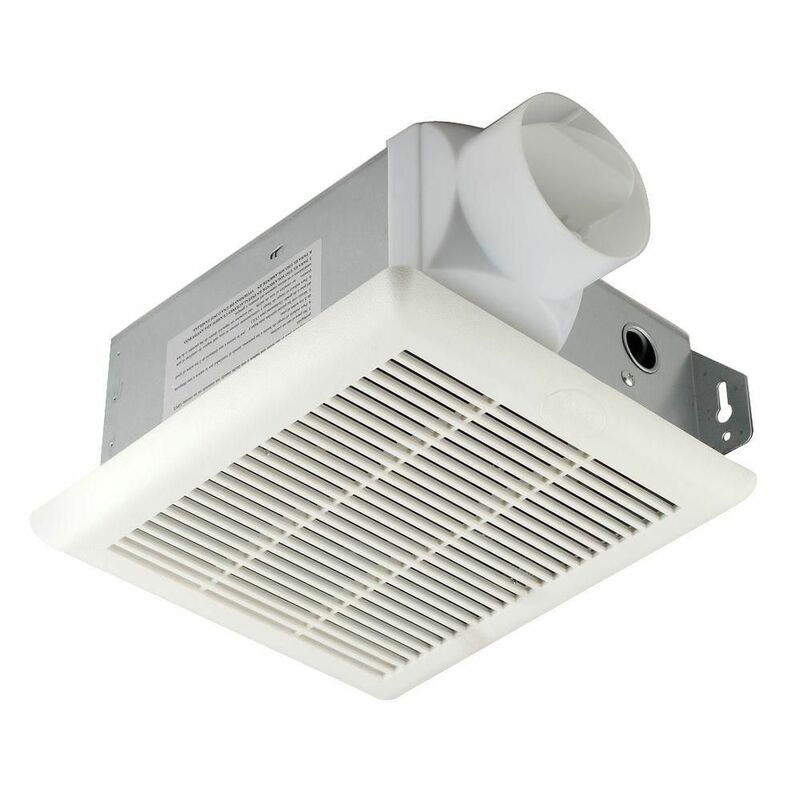 Operating at 4.0 sones, this exhaust fan is designed to manage moisture in bathrooms as large as 70 sq. ft. It features a high-quality AC inductor capacitor motor, which provides long-lasting runtime. This UL-listed fan offers a low-profile grille style for an attractive look. For brilliant audio performance concealed in your bath fan, use the Bluetooth-enabled Broan 110 CFM Exhaust Bath Fan equipped with dual high-fidelity Sensonic speakers. While wireless speakers clutter counter space, this fixture fills the room with rich sound from overhead. Relax in your own space and enjoy music and news from a smart device with no required application thanks to the fixture's Bluetooth functionality. Operating quietly at 1.0 sone to keep background noise minimized, this bath fan is ENERGY STAR-certified for its modest power consumption, contributing to lower electricity bills. Exceptional ventilation is vital to protect your home and family from mold and mildew caused by moisture, unpleasant odours, and even poisonous gases like carbon monoxide. Eradicate these problems with the incredibly quiet and powerful Cyclone HushTone bath fan. Imagine breathing easy, knowing your family is in a well-ventilated home, free of mold, mildew and indoor pollutants. Features a convenient and hassle-free method of combating excess moisture in the air that causes mold and structural damage to your home. The humidistat senses increases in humidity and automatically turns the bath fan on, regulating the moisture levels in the air for optimum comfort. For added control the humidistat comes with a timer from five to sixty minutes. 70 CFM, 4 Sones Exhaust Fan The Hampton Bay 70 CFM Exhaust Fan will reduce moisture and humidity in your bathroom to help prevent mildew. Operating at 4.0 sones, this exhaust fan is designed to manage moisture in bathrooms as large as 70 sq. ft. It features a high-quality AC inductor capacitor motor, which provides long-lasting runtime. This UL-listed fan offers a low-profile grille style for an attractive look. 70 CFM, 4 Sones Exhaust Fan is rated 2.1 out of 5 by 72. Rated 1 out of 5 by Mike from Do not buy this fan I wish that I would have read the reviews before purchasing and installing this fan. It stopped working within a week. Although there is a 3 year warranty on this product, they do not supply individual parts to replace the blown motor. I will be cutting into my recently finished wall to remove this unit and replacing with a different product from a different brand. Rated 5 out of 5 by WhiteGhost from Excellent fan! This fan was purchased to replace a very worn out one. It may not be the quitest and definitely not the loudest but when hooked up properly and vent attached and clamped it really pulls air which is why we buy these things. Very impressed at this price and simple to install , would definitely recommend. Rated 1 out of 5 by jrry660 from Bought in 2013 and installed. 2017, it stopped working. Should have gotten a Nutone instead. Poor... Bought in 2013 and installed. 2017, it stopped working. Should have gotten a Nutone instead. Poor quality fan. Rated 2 out of 5 by fanboi902 from No so great features.... I bought two of these fans for my master bath and ensuit bath, since they were being installed in my shower we had to cut the shower install in the master bath to fit the fan through the roof in the attic and box in to keep insulation out. Of course we tried the first fan in the ensuit and it worked fine and so we installed and moved to master bath, where there was more involved. After installing the fan and boxing it in in the attic, we siliconed around the opening in the shower and put the cover on. When i hit the switch, to my surprise, a puff of dust shot out? The motor was blowing out, not exhausting in, even after we took it apart, wired it backwards and tried again, still blowing out. It is a faulty motor, defective from the factory, yet somehow it still managed to me sold to me and sealed in the roof of my new home. Needless to say I am not impressed and would not recommend this product to anyone, too bad because the one in my ensuit is actually quite quiet and works well, but 50% odds are not something I look for when building a home, big time fail HB.. Rated 1 out of 5 by Bob from Stay away from this product MOTOR CEASED AFTER ONE WEEK. May not be able to replace. Since I bought it instead of the electrician I will probably have to pay him for a second install. Do not buy this unit! Rated 2 out of 5 by BusyParents from Not impressed Fan/motor is louder than expected (louder than the old one that it replaced). Professional electricians installed and it shorted. They discovered the issue and corrected...which could be considered a design flaw. It's working fine now, but I will not buy this same model when my other bath fan needs replacing. Rated 5 out of 5 by Anonymous from Easy Installation We are remodeling all of our bathrooms. The house did not have any exhaust fans. We weren't sure if we coukd install them. We found out that they are very easy to install. Glad we took the challenge!